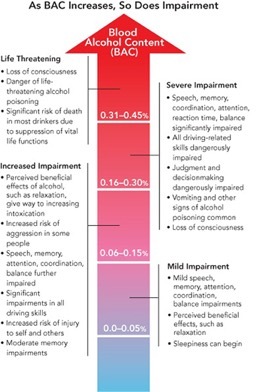 Blood alcohol concentration, also known as BAC, is the measurement of the percentage of alcohol in a person’s bloodstream. For example, at a BAC of 0.10, your blood composition is 0.1% alcohol. All fifty states have set 0.08 as the legal definition of DUI impairment, which begs the question, after how many drinks are you considered legally drunk? Even with an equal body weight, women become intoxicated at a quicker rate than men. Alcohol spreads throughout the water of a human body when consumed, and men’s bodies have a higher water percentage than women’s bodies. Therefore, even if both a male and female drink an equal amount, the effect is similar to putting the same amount of alcohol into a smaller bucket of water (female). In addition, women have lower levels of alcohol dehydrogenase, the alcohol-metabolizing enzyme. More alcohol therefore goes directly into a woman’s bloodstream rather than first into the stomach. The body is able to break down 0.5 oz (14 g) of ethanol per hour. A standard drink (one 12 oz beer, one 5 oz glass of wine, or one 1.5 oz shot of distilled spirits) contains 12 grams of ethanol. Therefore, the average person is able to process approximately one standard drink per hour. Can’t a cold shower or a cup of coffee be the quick fix? Unfortunately, time is the only cure for sobering up. Drinking alcohol on an empty stomach seals the fate of many. Alcohol, unlike food, passes quickly into the bloodstream because it doesn’t need to be digested. It is then quickly dispersed throughout every part of the body. When one eats along with drinking alcohol, his or her BAC will be much lower because food causes alcohol to enter the bloodstream at a slower pace. From prescription medication to allergy pills, many types of medication cause a negative reaction when mixed with alcohol. Always be sure to check the labels, and reach out to your doctor for specific instruction. Drinking alcohol while on certain types of medication can lead to serious health effects. Ultimately, it’s important to keep in mind that everyone doesn’t reflect the same BAC after four drinks, for example. Want a rough estimate based off of gender, weight, type of drink, number of drinks, and time spent drinking? Use the BAC Calculator from Aware Awake Alive to gauge your blood alcohol concentration. “Blood Alcohol Concentration (BAC).” In The Know Zone. N.p., 2011. Web. 4 Aug. 2016. <http://www.intheknowzone.com/substance-abuse-topics/alcohol/bac.html>. “Blood Alcohol Concentration and Calculator.” Aware Awake Alive. N.p., 2016. Web. 4 Aug. 2016. 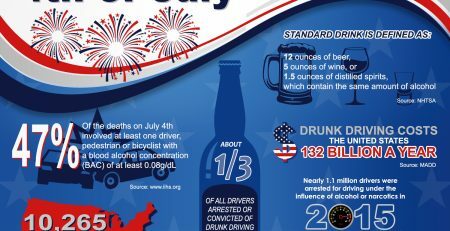 <http://awareawakealive.org/educate/blood-alcohol-content>. “Blood Alcohol Concentration Definition.” Blood Alcohol Calculator. N.p., 2016. Web. 4 Aug. 2016. <http://bloodalcoholcalculator.org/educational/blood-alcohol-concentration-definition/>. Stim, Rich. “Blood Alcohol Level Chart/Are You Legally Drunk?/BAC Level.” Driving Laws. NOLO, 2016. Web. 4 Aug. 2016. <http://dui.drivinglaws.org/drink-table.php>. “What Is Blood Alcohol Content and How Is it Measured?.” Sobering Up. N.p., 2011. Web. 4 Aug. 2016. <http://soberingup-tnt.weebly.com/the-facts.html>.